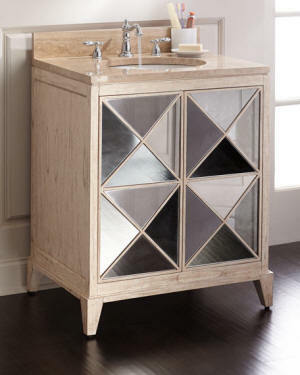 French style bathroom furniture for added glamour. Mirrored vanities and lovely vanity seats plus all the perfect extras. Handcrafted chair. Alder wood frame. Polyester velvet upholstery. Handcrafted vanity chair. Tufted inside back. Upholstered cone base. Alder wood frame. Fabric: polyester velvet. Handcrafted vanity chair. Alder wood frame. Polyester/rayon velvet upholstery. Handcrafted vanity seat. Alder wood frame. Polyester/rayon velvet upholstery. Handcrafted chair. Alder wood frame with dark-walnut finish. Polyester velvet upholstery with button tufting. Handcrafted vanity seat. Alder wood frame. Polyester upholstery. Handcrafted parson's-style bench. Acacia wood frame. Eglomisé mirrored glass on leg panels. Tone-on-tone rayon/polyester upholstery. Handcrafted sink chest. Dimensional pyramid doors are covered with antiqued mirror. Top is made of Italian silver Travertine with an undermount porcelain sink. Single storage with one adjustable shelf beneath sink. Mindi solids, mindi veneer, travertine, mirror and porcelain sink bowl. Bench made of select hardwoods and mirrored glass. Linen upholstery. Silver-leaf finish. The perfect perch for in front of the vanity—or even a petite writing desk—this dainty chair features a beautifully shaped back and a full, flirty, gathered skirt. 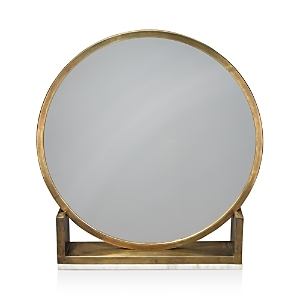 We especially like the shirring and broach-like detailing on the back Handcrafted storage mirror. Frame made of poplar and hardwood solids with pecky pecan veneers. Fluted pilasters; raised carvings and detailed scrollwork. Hand-antiqued, distressed finish. Single door locks with skeleton key. Handcrafted vanity seat. Alder wood frame. Polyester upholstery. 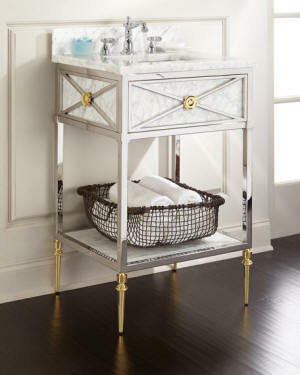 Inspired by French Empire style antiques, this small scale sink chest features a stainless steel frame accented with polished brass rosettes and turned feet. The apron, vanity and shelf are white Carrera marble. Handcrafted ottoman with imperial metal "X" base. Faux Mongolian lamb (polyester/acrylic) upholstery. Platform seat; foam cushion. White lacquer cabinet with gold leaf frame and glass shelves. 45"W x 18"D x 80"T. Iron and wood. Tufted vanity chair has alder wood frame and polyester/rayon upholstery. Sure to captivate—this gracefully designed vanity seat features an intricately sculpted back accentuated with button tufting and piping and a box-pleated skirt to evoke modern glamour With its combination of scalloped back, button accents, box-pleated skirt, and curvaceous legs, this little vanity chair is a delightful addition to a bedroom, powder room, or dressing area. And its peacock-blue upholstery makes it all the more appealing. Handcrafted bench. Acacia wood frame with hand-painted gold-leaf and eglomisé finish. Tufted-leather upholstery. Hand-tufted ottoman. Hardwood frame. Polyester/cotton upholstery. Handcrafted vanity with seven drawers. Custom ring pulls with crystal flower pendants. Rubberwood solids and veneers. Felt drawer bottom in top drawer. Cedar drawer bottom in bottom drawer. Handcrafted beveled tri-fold mirror. Hardwood frame/rubberwood solids and veneers. Hardwood frame. Cotton and cotton/linen upholstery. Brass nailhead trim. Tufted ottoman with hanging tassel trim. Birch plywood frame with a combination of upholstery weight fabrics consisting of cotton and rayon. Cotton trim. Ceramic feet. Paneled velvet footstool with hanging tassels. Birch and plywood frame. Silk; foam cushion. Handcrafted bench. Hardwood frame; acrylic legs. Viscose/polyester/rayon tufted upholstery. Bale pouf ottoman in pink/gold. 18"Sq. x 18"T. Faux shagreen upholstery. Hand-painted, gold-leafed hardwood frame. Handcrafted velvet ottoman. Brass metal legs and marble top. Alder wood frame. Upholstery: polyester velvet. Handcrafted velvet bench. Grey and white marble inlays with gold outlines. Alder wood frame. Upholstery: polyester velvet. Tufted top and sides. Handcrafted tufted ottoman. Alder wood frame. Upholstery: polyester. Hand-set clear Austrian crystals and light green hand-enameled interior. Gold tone metal finish. Metal/Austrian crystals Handcrafted print in classic matte and frame presentation. Acrylic glaze provides lightweight protection, handmade. Molding made from 100% maple. Canvas floater frame. Stoneware spoon rest on aluminum stand. Hand-painted with gold leaf details. Spoon rest also serves as a soap dish for kitchen or bath. 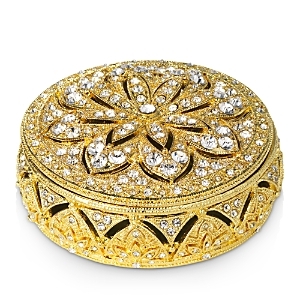 Ornate box with lid for storing jewelry and trinkets. Hand-set Swarovski crystals and semi-precious serpentine stones. Hand-enameled interior The bold colors of the butterflies in motion are accentuated by a hand-colored background. The top mat is hand-painted in a crisp white with gold leaf bevel. The piece is completed with a narrow wood molding with a gold finish. Cleanse your skin naturally. Our sponges are both highly absorbent and extremely durable. Plus, they’re biodegradable, self-cleaning and hypoallergenic – a smart, eco-friendly choice for multiple skin types. These elegantly styled additions to the Mercer Collection bring order to the bath counter. Set of three bar soaps carved with your initials. Infused with the water-based fragrance of aqua mineral. Gentle on sensitive skin. 100% vegetable based. Triple milled. Carved with three-initial monogram in script typestyle; initials will appear in First, Last, Middle order. Perfect as a gift or for adding a personalized accent to your bathroom's appointments, this fingertip towel set from Avanti features a super-soft, absorbent design embroidered with a sparkling monogram in a polished silver tone. 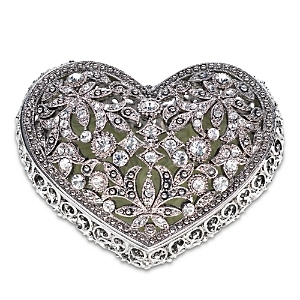 Heart-shaped box with lid for storing jewelry and trinkets. 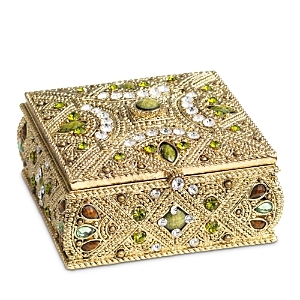 Intricate filigree design with hand-set clear Swarovski crystals. Hand-enameled interior Set of three bar soaps carved with your name. Infused with the water-based fragrance of aqua mineral. Gentle on sensitive skin. 100% vegetable based. Triple milled. Carved with two lines of personalization; specify up to 12 characters/spaces each. Artisan glassblowers create each of our bath accessories by hand, designed to mix and match with any color scheme or style. Our PB Classic Glass Canisters come in assorted shapes and sizes to store everyday essentials from bath beads to cotton balls. Handcrafted print in classic matte and frame presentation. Acrylic glaze provides lightweight protection, handmade. Molding made from 100% maple. Canvas floater frame. Our PB Classic Glass Apothecary Jars are modeled after those used for centuries to store dried herbs. Handcrafted glass and steel bathroom vanity. Vanity sconce with gleaming silver-tone finish sparkles with dozens of square and oblong pendant crystals. Handcrafted steel ceiling mount with crystal drops. Handcrafted steel vanity light with assorted crystal drops. Giclée on canvas with hand-applied gel finish. Silvertone float frame. Handcrafted steel vanity light with hanging discs.